This past weekend, at the tail end of a record-breaking streak of lovely summer weather, I pulled up the remains of the lettuce bed. I didn’t really want to. The sad and bedraggled lettuces still looked better than a naked bed, but there wasn’t any point in watering them and I figured that what was done was done. I have fond memories, though, of this year’s lettuce patch. We stuffed ourselves on huge salads most August days, and I enjoyed the beauty of many different types of lettuces in the back corner of the garden. ‘Prizehead’, once again, proved to be a winner. The lettuces grew the most head-like of any that I planted this year. My seed germinated very reliably and even hung tough when uprooted several times by a mole in mid-spring. ‘Deer Tongue’ grew just as Territorial’s catalog promised. 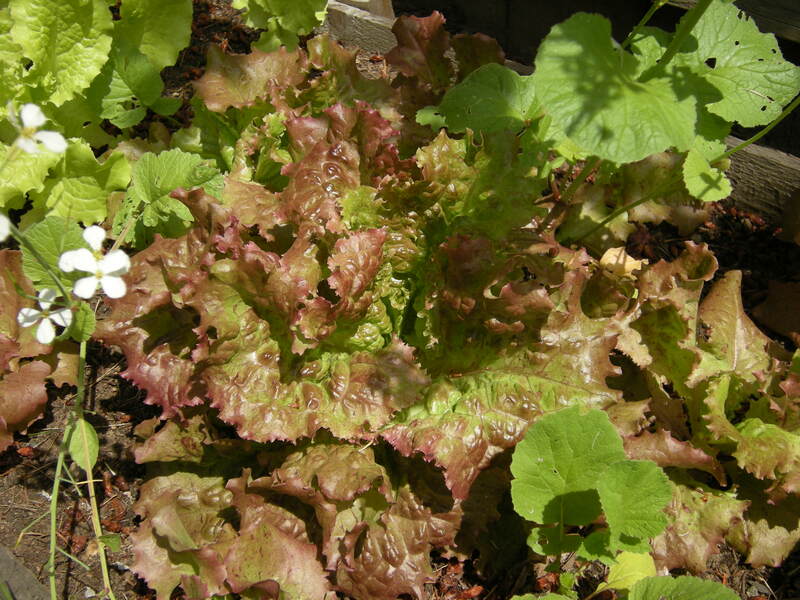 This lettuce has a lovely geometric form, with thick, succulent leaves. Slow to bolt, the remaining plants were the only ones I couldn’t bear to tear out of the bed. They won’t be much for eating after the warmth we’ve had, but they’re still pretty to look at. A big plus for this lettuce, in my book–the smooth leaves meant very easy cleaning. ‘Black-seeded Simpson’ didn’t impress me. 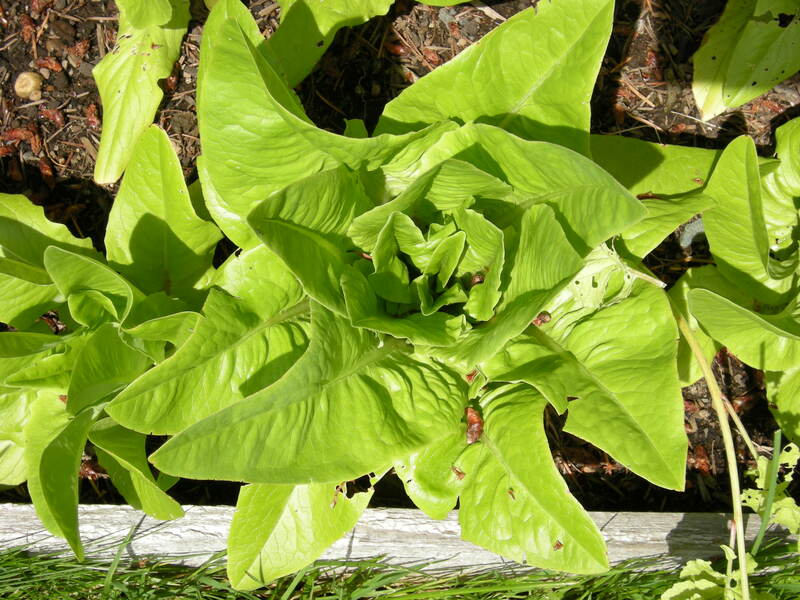 This is a classic lettuce for home growers, mentioned as a standard reliable in many books. Of all the lettuces I grew this one had the least head-forming shape, sprouting small round leaves off a thick central stalk. The taste was OK, not as flavorful as other lettuces. Maybe a good home grower for fans of traditional iceberg-type lettuce. I don’t know if I’ll grow this one again. ‘Red Sails/Lolla Rosso’ was another winner. Heads formed loosely but prettily and while the color wasn’t that impressive in the garden, when washed and chilled and made into salad the red-freckled leaves were simply gorgeous. Lovely flavor and a good producer in my garden this year. 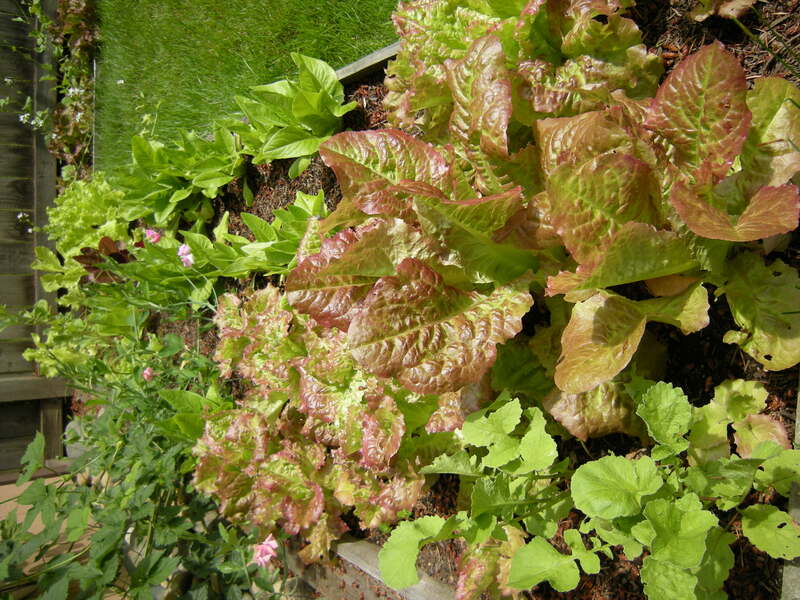 In addition to these 4 types of lettuces I planted 2 seed mixes–‘Bon Vivant’ and a “gourmet blend” that included the mythical ‘Speckled Trout Back’. The first was unimpressive in my garden this year, with poor germination and growth. Perhaps the seed is simply old–last year’s results were better. The gourmet blend was a smash. The lettuces were all so pretty I could hardly bear to clip them. Germination was fantastic and the blend was beautiful in the bed. I’ll look forward to growing it next year. A tip for harvesting your lettuce: In the cool morning, go out and cut your lettuce. Wash the leaves promptly. I pat them dry and then wrap them in a plain cotton kitchen towel–the flour-sack kind of drying. Then I put them in a plastic bag in the fridge. Packed up this way, the greens will stay crisp and fresh for over a week….making it the simplest thing in the world to assemble a fresh salad while cooking dinner. 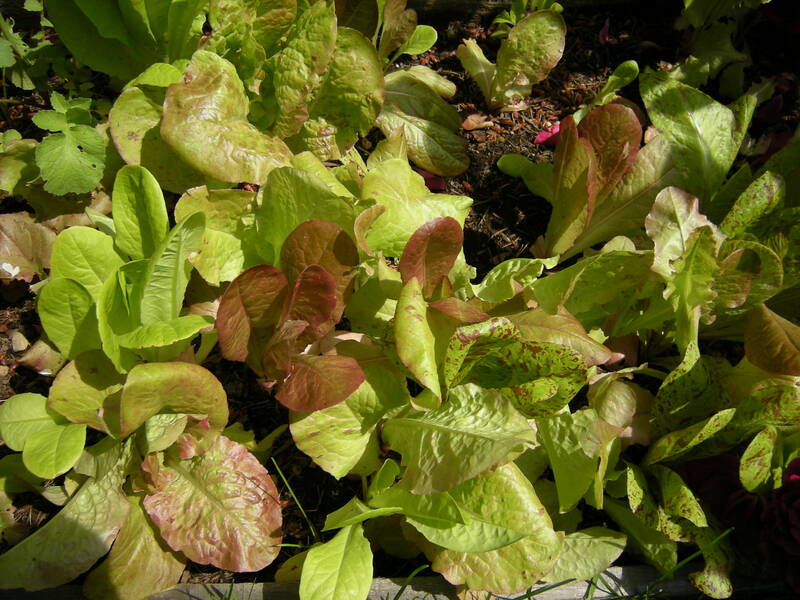 Whether you plant some seeds in a pot or have a whole garden full, the pleasure of growing and eating your own lettuces is one that is hard to beat for the gardening chef. Bon appetit! This entry was posted in Edibles, Gardening. Bookmark the permalink.